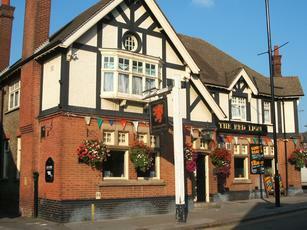 The Red Lion is a fairly large pub on Bushey's High Street. It had the Six Nations rugby on TV screens and it seems to cater for both drinkers and diners. Fuller's London Pride & Sharp's Doom Bar are the two regular ales. Guests were Brentwood Legacy, Windsor & Eton Last Drop & Tring Citra Session. I opted for the Last Drop, which wasn't that good. But, my drinking companions went for the Citra, which they were clearly enjoying. I read in the local CAMA magazine that the pub is under threat of closure. Superficially, the pub looks really well, offers a good range of beer and ales, appears to have a great menu, nice beer garden, screens for football etc, etc.. But something is not right in here. The clientèle, again at first glance ,appear decent and respectable, but there's a real undercurrent in her making you feel almost instantly identified and unwelcome as a stranger. Nothing blatantly nasty, but small things like refusing to move to allow access to the bar, being passed over for locals when trying to order, generally feeling that you are being "sussed out". Its cliquey and too villagey. You sense everyone knows everyone. Hi Beer Lovers I am the new GM of this pub, I have just took it over a month ago, and I can assure everyone who is visiting this pub, maintaining the quality of the ale/beer lines/ products were on the first thing on my list with many others. Please visit us, and see the difference.